Greetings to all the new and old members of the Fairbanks Marching Band! We are signed up for the Union County Fair again this year. If you would like to sign up...please give me a call and let me know which shift you would like to take. It is on a first come first served basis as to who gets which shift. So don't delay! You will receive $5.00 per each hour you work off of your camp bill. We have various shifts available for both gates and no one under the age of 14 is allowed to man the gates. Sorry, Fair rules! We will open the gates up at 8:00 am and go until 9:15 pm. Tuesday July 23 and Wednesday July 24. Please sign up today! The music boosters are asking this year for each family to purchase a 24 pack of water and bring it to band camp check in! It doesn't matter the brand. You can go to Aldi's and get theirs for $3.00 of less. This will help out with the water situation at camp. They can even be the half water bottles. We will use them at camp and then any extra will go with us to the football games and competitions! If you forget ...we will just add $3.00 to your camp bill and will go purchase them before we leave the camp that evening. If we all help out then no one person is doing it all. Easiest way we could think of. 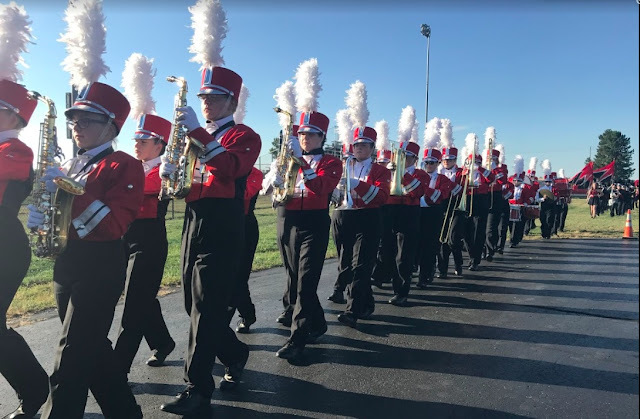 We also have availability for chaperones at band camp...shifts are Monday thru Friday....8-11:30 am/ 6:00-8:30pm and then an adult chaperone over night... you many stay if you choose to, there is a bed available and breakfast in the morning. Please call me if you would like to help out! Last but no least...remember to sign up your Kroger cards to go to the Fairbanks Music Boosters! Every little bit we can get helps out the organization! Enjoy your summer and let me know if you would like to sign up!